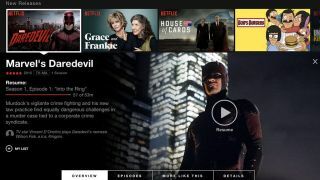 We knew it was coming, but now Netflix has rolled out a completely refreshed and redesigned web interface to all of its users, replacing the dreadfully slow and outdated carousel version we've had to make do with in the past. The new design has kicked Netflix's old scrolling carousel design to the kerb, in favour of a approach that's more in line with the service's apps across smart devices. Users will now click to horizontally cycle through through batches of titles, which is a much quicker process than hovering a mouse cursor at the end of a row and waiting for new titles to scroll into view. In addition to Netflix's faster browsing method, it's now easier to select specific episodes and view information about Netflix shows and movies. Currently for most users, clicking on a title will automatically start playing it, and hovering over it will only give you a tiny bit of information about it. In the new version, clicking on a title keeps you on the same screen, divulging movie, show and episode information specific to the title right below it. It will also reveal an extra set of options that allow users to easily choose an episode, find similar shows or movies, add the title to their My List and more.